PLEASE NOTE: substitute 100% nut butter with nothing else added, in place of peanut butter for a healthier version. Try almond butter, pecan butter, walnut butter, or cashew butter. 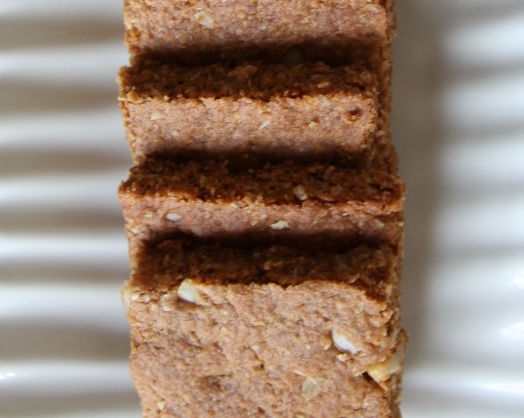 Peanut butter bar cookies with oatmeal as "flour", all natural peanut butter, and coconut sugar are healthier but you can use regular peanut butter and sugar. To make these gluten-free use gluten-free rolled oats or use regular rolled oats if you aren't gluten sensitive. Mix sugar, peanut butter, oil, and egg in a medium mixing bowl then set aside. Add oatmeal "flour" to the bowl along with the baking powder, baking soda, and salt and mix well. Chop the nuts, raw nuts are healthier but you can use roasted nuts, too. You can use any kind of nuts that you like. Mix the chopped nuts into the cookie dough in the bowl. Grease a 13 inch by 9 inch glass casserole dish with a little coconut oil or other oil. Spread cookie dough evenly in a thin layer, pressing the dough down so it's smooth on the top. Bake for 12 to 15 minutes or until the edges of the cookie are lightly browned and a toothpick in the middle of the pan comes out clean. Do not over cook or the cookies will be dry. Remove from oven and cool completely. Refrigerate cooled cookies before cutting for easier handling...the cookies won't be as dry and crumbly once they are chilled. 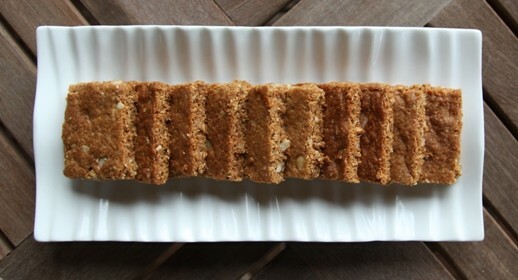 Store in an airtight container and keep the peanut butter bar cookies in the refrigerator until ready to serve.